On Saturday, June 16, 2018, another young lady, Fiona Kent, entered our Monastery to begin her Postulancy. She will be known during this time as Sister Fiona. During this time of Formation, Sister will continue with human and doctrinal formation and begin learning the basics of Cloistered, Contemplative Carmelite Life, prayer, Sacred Scripture, History of Carmel and all about our great multitude of Saints and Blesseds and deepen her devotion to Our Lady of Mount Carmel and our charism of prayer and sacrifice for Priests and Missionaries. 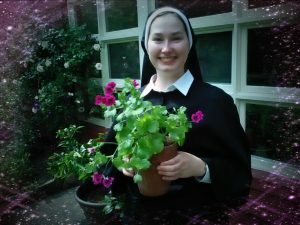 Please pray for Sister and join us in praying for more healthy, holy vocations to our Carmel. To see more photos of the special occasion, click here.